Companies are constantly searching for ways to innovate and improve efficiency. One such method is to incorporate a Business Process Management (BPM) solution into their organization. BPM involves the modeling of a business goal into distinct steps and expressing these steps visually as a workflow. There are a number of BPM solutions available on the market today, with one such solution being jBPM. jBPM is a suite of tools which aims to bridge the gap between business analysts and technical developers. There are two versions currently available, jBPM3 and jBPM5. While they each have similar goals, they are built on very different technologies. In this post, I will introduce the core technology behind jBPM3 and illustrate the underlying technology by building a simple application and deploying the application on the JBoss Service Oriented Platform (SOA-P). The key behind any BPM solution is the workflow defining the business process itself. A jBPM3 workflow is created as a process definition written in the jBPM Process Definition Language (jPDL) and expressed as an XML schema to describe a business process graphically. A process definition contains the logic for the workflow and is expressed using nodes, transitions and tasks. The process definition, supporting classes and libraries are packaged into a process archive (.par) file and deployed to the JBoss server. Process archives are deployed one of three ways: programmatically, using an Ant task or through the jBPM console. Seeing as jBPM3 has been available for a few years, there is a wealth of documentation compiled by others in the open source community. However, the best place to start is with the https://access.redhat.com/knowledge/docs/en-US/JBoss_Enterprise_SOA_Platform/5/html-single/JBPM_Reference_Guide/index.html as it covers the entire stack. To help illustrate various concepts, we will build a sample application for an order intake system. At a high level, this is a very simple application. The contents of an order are received. Based on the details of the order, the order is either approved or denied. A notification of the results is then sent via email to a single recipient’s email inbox. jBPM3 is included in the default, production and all profiles of the JBoss SOA-P so one of these profiles must be used for running the application. jBPM is functional out of the box, however further configuration is required for providing additional features as you will see shortly. Process definition and state is persisted to a database and is configured in the jBPM datasource file located at <JBoss_Root>/server/<JBoss_Server_Profile>/deploy/jbpm.esb/jbpm-ds.xml. Import the project into JBoss Developer Studio as an existing Maven project. If JBoss Developer Studio 5 is used, the SOA Tools add on must also be installed. It can be installed from the Software Update page within JBoss Central. You can view process definition and node properties through the Properties view. If this view is not currently visible, it can be opened by navigating to Window -> Show View -> Properties. If this is not an option, click Other… Within the Show View window, expand General and select Properties. Within the execute method, we create a random user id and random order amount and set two process variables within the ExecutionContext. Finally, we tell the ExecutionContext to leave the node and proceed to the next step in the workflow. We want to have our workflow take different actions depending on whether the price of the order is above or below a certain threshold. This is accomplished by adding a decision node to the workflow. Decisions can be modeled directly in the workflow using Expression Language, Beanshell scripts, or an external entity. Personally, I prefer using the external entity route by providing a Java class as it gives you finer grained control over the decision making process. A Java class handler which extends the DecisionHandler interface is used. The interface specifies the decide method which must be implemented returning a string value as the name of the outgoing transition which should be taken by the workflow. In our application, we have created the AmountDecisionHandler class for this purpose and created two outgoing transitions from the decision node to fulfill the handler requirements. In our handler class, we check to see if the order amount is greater than $100. If the condition is met, the transition with the name “Approved” is taken, otherwise the transition with the name “Denied” is taken. Configuration of email server properties is made in the jBPM configuration file (jbpm.cfg.xml). Alternatively, these settings can be placed in a properties file which is configured by setting the resource.settings.properties property to the name of the properties file. Both files would be located at the root of the classpath. The following table describes the settings required for email configuration. You will find the jbpm.cfg.xml and a jbpm.mail.properties file in the src/main/resources folder of the sample application. Fill out these values accordingly to match your email server configuration. If you plan to deploy the sample application to your JBoss server, you must modify the jbpm.cfg.xml file in the <JBoss_Root>/server/<JBoss_Server_Profile>/deploy/jbpm.esb/ folder. Modify the property jbpm.mail.smtp.host which by default is set at local and update with the appropriate value. Be sure to add the other configuration, or if using an external properties file, remove the jbpm.mail.smtp.host configuration property and add a resource.settings.properties configuration. The second component to sending emails within jBPM is to configure email nodes within the process definition. In the sample application, open the process definition and you will notice two email nodes are defined. Click on one of the email nodes and inspect the properties. You will see a series of tabs on the left side of the pane. Click the Mail Info tab to view the details of the outgoing email. The only value requiring modification is the “To” field. Enter a destination email address you would like to have emails sent to from the sample application.The subject and body of the message has already been preconfigured. Within the previous sections, we have described how to modify the sample application in order to run as a JUnit test or deployed on a JBoss server. I’ll admit a lot of content was covered so I’ll provide the CliffNotes version just in case you skipped the sections above. Feel free to skip this section if you already made the necessary modifications otherwise refer back to the previous section for any material which may appear unclear. The provided JUnit test class Jbpm3WorkflowTestIT emulates the executions of jBPM processes. The provided sample will test both workflow decision conditions: an approved order and a denied order. As mentioned previously, process definitions can be deployed multiple ways. Personally, I prefer to build the project using Maven and deploy the resulting process archive in the jBPM console because it allows me to view the contents of the process archive prior to deployment. If you view the server console, you will notice the workflow has taken the appropriate decision based on random sample values, an email notification has been sent to the configured recipient and a message has been printed with the results of the decision to the server console. That’s it! We have successfully run our sample jBPM3 application as both a JUnit test and deployed on JBoss SOA-P. In an upcoming post, we will cover the latest release, jBPM5, and how the jBPM platform transitioned to the JBoss Business Rules Management Platform (BRMS) world and how jBPM5 compares to jBPM3. Congratulations. From the estimated 200 million blogs on the internet today, you have found your way to this neck of the information superhighway. Before we delve into real business, lets take a step back to who I am. My name is Andrew Block and I live two things: technology and sports (hence the tagline at the top). While my two hometown teams, the Buffalo Sabres and Buffalo Bills, continue their path towards futility, I’ll go beyond the X’s and O’s to provide more than you would find on the front page of espn.com. While sports will be a frequent topic, it will not be the primary subject. Technology, ever increasing throughout our lives, will be the primary topic of discussion. The majority of posts will be how to’s and best practices on a particular piece of technology (yes, even including this post, but we will get to that later). So, now that we got that little introduction out of the way. Let’s get down to business. The title of this post beyond the introduction is “how we got to this point”. How did we get to this point? Over the past few years, I have written and contributed to a number of technology best practice documents. However, most of these were internal documents. I came to the conclusion that others outside my organization would also find these tidbits of tech useful. So I decided to go down the route of countless others on the internet today: start a blog. This isn’t my first attempt at “blogging”. I had a short lived blog which was written using one of the first versions of Movable Type. That was quite some time ago considering Movable Type was released in 2001. While I could have consulted the handy “Blogging for Dummies” book, I did consult 16 Ideas To Avoid Complete and Utter Failure. Fairly useful and has helped shaped the blog into what it is today. One of my personal traits regarding technology is that I like to get my hands dirty. While I could have gone the easy route by choosing a somewhat preconfigured site like Blogger or a hosted solution provided by WordPress, I wanted to be able to control my own destiny (like a team choosing to go last in a shootout). I chose WordPress, as emphasized by the aforementioned best practices document, from the countless blogging software options available. The next step was finding a home. I have a number of domain names in my possession and since this was a personal blog, I decided to fall back to andyserver.com which happens to be the oldest in my collection. This domain was never hosted by any hosting provider and was once hosted out of my basement. To avoid paying a hosting provider to house this blog, I turned to a Platform as a Service (PaaS). A Platform as a Service is a way to rent hardware and other services to deploy and run applications. Red Hat’s OpenShift platform was a perfect match to house my blog as it allowed me to get my hands dirty with the configuration and management, but more importantly, it was free! The rest of this post will explain the steps necessary to spin up a WordPress blog on the OpenShift platform. To get started, first create an Openshift account at http://openshift.com. After registering and confirming your email, you are presented with a list of possible applications types to create. These types range from Java, Ruby, Python amongst many others. In addition, there are a number of preconfigured applications (called instant apps) which will allow for apps to be spun up even faster. One of these options is WordPress which will package and configure PHP, MySQL, and the WordPress software. Perfect! Once this is selected, you are asked to create a name for your application and if this is the first OpenShift application, you are also asked to create a namespace for your OpenShift account. A namespace is essentially a subdomain for all of the applications you deploy. Once a namespace is set, it cannot be changed so be sure to think long and hard on this name. Go ahead and click Create Application to create the application. Once the application has been created, you are presented with a page detailing key information about your application such as MySQL connection information and the publicly accessible URL for the application. Clicking on this URL initially redirects to the WordPress initial configuration page where basic WordPress settings are made. Also on this page is a link to key documentation to the the initial installation and configuration process. Enter the required information and select Install WordPress. 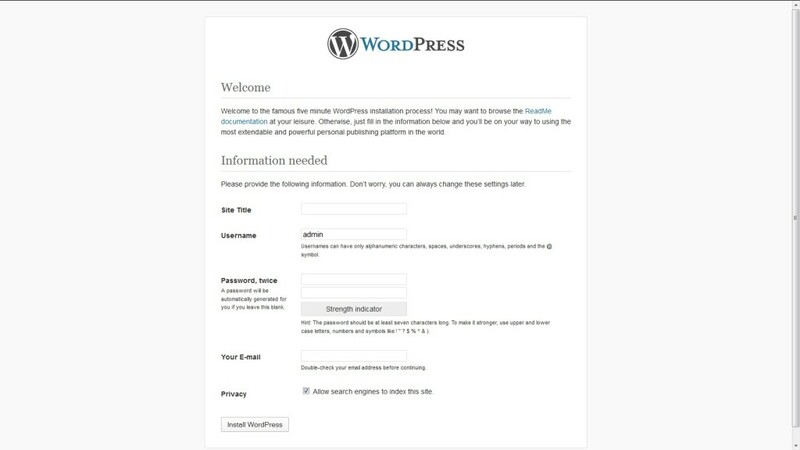 Once successful, you will be able to login to the WordPress Administration Console using the username and password previously configured. I’ll forgo the discussion on configuring WordPress, but consult the full documentation to learn more on how to manage your blog’s settings, modify the appearance, and add plugins to expand functionality. With the configuration now complete on the domain side, we now turn to the OpenShift configuration. While a number of application configuration options can be managed through the online management console, some configurations cannot. The management of cname records cannot be managed online and must be leveraged through the OpenShift command line tools. Available for Windows, Mac and Linux platforms, these tools provide full configuration and management of OpenShift applications. Detailed installation and configuration of these tools with your machine can be found on the Installing RHC Client Tools page. If the command was successful, the alias can be verified on the application properties page of the OpenShift web management console under the alias section. With the configurations now complete on both the domain and OpenShift side, try to access the blog using the cname address. Keep in mind that even though both steps were completed successfully, your application may not be reachable due to the DNS propagation delays. Once your site is reachable by its cname value, the final step is to configure the base URL within WordPress. Login to the administration console of your blog and navigate to the General page under the Settings section. Set the WordPress Address and Site Address URL to your cname value. Congratulations, your blog is up and accessible by your countless followers. And that is how we got to this point. We started off introducing the Block 87 blog. 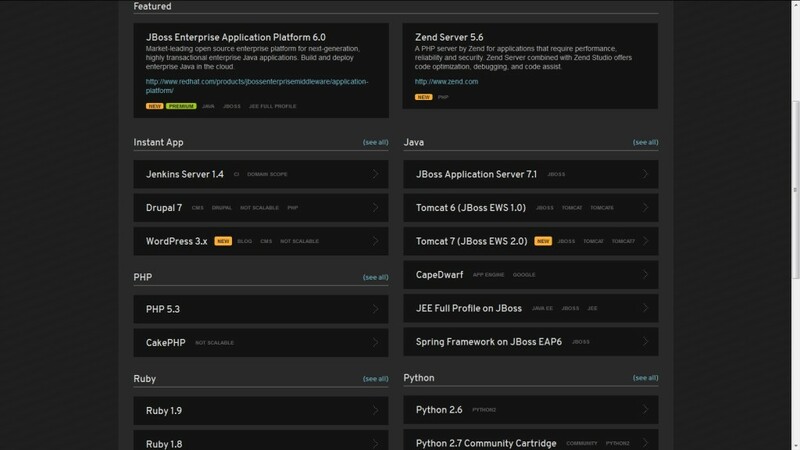 We then introduced the OpenShift platform not only as a way to deploy and run applications in the cloud, but how to get a blog of your own like this one up and running. This is only a taste of things to come. Stay tuned.